Everyone who is a forex trader today started with a forex demo account and learned through practice. Forex learning and education is best complemented by practice. So join today! Find a broker that appears most friendly on this site (forex broker comparison) and open a demo account. It is free and there are no obligations – you have nothing to lose! 2) a client-side trading platform that will generally need to be downloaded and installed on your personal computer or laptop. Both options will require an internet connection to perform trading activities. The trading interface for forex demo accounts should be similar or identical to the actual trading platform you will be using when you go live trading. This will allow you to get intimately familiar with the process you will need to go through to enter orders, manage positions and execute trades. Customization in screen colors, window placement, "one-click-trading" fall into this. Also, if you wish to practice trading more using your demo account, you will probably want to have an account with a larger initial amount of virtual money to play with. Amounts around $50,000 seem to be the norm for virtual money provided with demo accounts. Most demo accounts come with basic charting software that you should assess and use to make your trades. If you would like to learn more about forex charts and how to use them visit forex charts, followed by the forex trading strategy section. It gets right into using technical and fundamental indicators to make simple as well sophisticated trades. 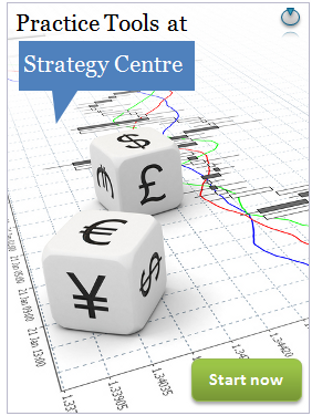 Customer support is an integral part of daily forex trading. There can be times when you are in need of help to close a trade when the software is slow or you did not put a stop loss/take profit. Use the customer service to test their responsiveness to queries before you "go-live" with a trading account. The standard for customer support varies widely among brokers, so find one that will best fulfill your needs. The best forex demo account software will display close to real-time exchange rates that change along with the market as it ticks up and down over time. This will give you a good sense of whether or not the trading strategy you intend to employ in live trading, would actually have worked over the time period you are using for demo trading. Many forex demo account providers also offer useful trading tutorials. These tutorials will usually be provided free of charge. Some of them also provide helpful information that can help you learn how to improve your trading techniques. Forex trading platforms often provide access to high-quality news feeds from professional forex market information sources that might include Reuters, Associated Press, Bloomberg or Telerate. You can often use a forex demo account to obtain access to such valuable news wires. Make sure you look for this. It can be vitally important for your new trade strategy. Live trading or "going live" is what most aspiring forex traders want to move on to after being successful trading a demo account. This means that you place real funds at risk on each trade, and your portfolio has to take whatever the market offers you in terms of profit or loss. Most traders just starting out in forex will want to see that their trading strategy works well on a demo account before taking the plunge to start live trading.